Your dog is more than just a pet; he’s a member of your family. That’s why, when it comes to caring for your four-legged family member, you want to make sure that you provide him with the very best of everything. You’ve done extensive research on all of the different products that you use with your pooch. You make sure that his dog bowl is filled with the most delicious and nutritious dog food (there are plenty of high-quality dog food brands to choose from). You use the best dog collar and dog harness when you’re taking him on his regular walks. You’ve also made sure that he has the most comfortable and supportive dog bed so he can thoroughly enjoy restful and restorative snoozes. There’s something else that you probably use with your pooch: dog treats. And if you aren’t using them, you really should. According to many pet parents, veterinarians, and dog training experts, treats are essential for canines. They are a great way to foster skills; for example, you can use them as rewards to teach him commands and tricks from a dog training book, you can offer them as snacks between meals, or you can use them to show your little guy just how much you love him. However you use dog treats, one thing’s for sure: you want to make sure that you are offering him the highest quality option. There are so many different types of dog treats on the market, but like all products for canines, not all treats are created equal. Unfortunately, many are made with poor quality, and even questionable ingredients that can have adverse effects on your pup’s health. Therefore, if you want to make sure you are offering your furry friend the very best, you’re going to want to make sure you are choosing safe dog treats for him. But, what are the best dog treats on the market? We’ve taken the liberty of finding out. Here’s a look at what we believe to be the top five dog treats. Now that you’ve had a look at our top picks for best and healthiest dog treats, let’s take a closer look at each one. Below, we offer a more detailed overview of each treat. In each review, we share the ingredients that are used in each option, why we think they’re the best, and what pet parents who have used these dog treats have had to say. After you read through the reviews and decide which option is the best do treat for your pooch, click on the buttons to find the best prices currently available on Chewy and Amazon. First up on our list of the best dog treats is Wellness Natural Well Soft Dog Treats. Wellness dog food is a very highly regarded brand, as they use the highest quality ingredients in all of the different formulas they make. The same can be said for the dog treats the manufacturer makes. These treats are soft, so their palatable and easy to chew, making them a great choice for puppies, canines that have dental health issues, breeds that have smaller mouths (like Chihuahuas, Pugs, and Shih Tzus). They also come in a variety of flavors. This option comes with three different flavors, including lamb and salmon, beef and turkey, and chicken and lamb. Other flavor options include chicken and venison, turkey and duck, gingerbread, and pumpkin. These Wellness treats are grain free, so if you feed your pooch a grain free dog food, they are a great addition to his diet. There’s absolutely no corn, soy, or other grains, and they’re also free of artificial colors and flavors. Each flavor is made with two different types of real meat, such as beef and turkey, or chicken and lamb, to increase the nutritional quality and flavor of the treats. They’re also made in the USA, are backed by a Wellness Guarantee, and are tested for quality assurance. 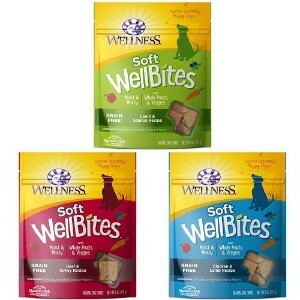 Final Verdict: Overall, we think that Wellness Natural WelBites Soft Dog Treats are an excellent option. Whether you’re using them as reinforcement for training or offering them as a snack between meals, your pup will surely love the taste and texture of these treats. 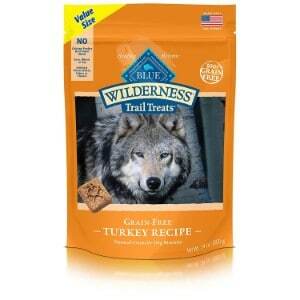 Blue Wilderness is another highly regarded dog food manufacturer. They make a variety of formulas for dogs of all life stage, sizes, and dietary needs; senior dog food, food for small dogs, and food for large dogs are just some of the recipes that they offer. They also make a wide selection of dog treats, and we think that their Grain Free Biscuits are some of the best that they offer. Since these treats are crunchy, they have a texture that is similar to dry dog food, so if your pooch loves kibble, then he should love these treats. They’re made with the highest quality ingredients, such as real duck, turkey, and salmon, which are excellent sources of protein. They also feature potatoes and flaxseed, which are easy to digest carbohydrates. These ingredients are not only tasty, but they offer vital nutrients that your dog needs, so they are a great addition to a well-balanced diet. Since they’re grain free, they are great for dogs that have sensitive tummies or allergies to grains, including corn, wheat, and soy. According to the reviews that we read, most pet parents are very pleased with these treats. It’s been reported that most dogs love the flavor. However, some pet parents said that the treats were a little too hard and that they had problems with delivery. Final Verdict: If you’re looking for a healthy, natural, grain free treat for your pooch, Blue Wilderness Grain Free Biscuits Crunch Dog Treats are definitely worth considering. They are made with the highest quality ingredients and, as per the reviews that we read, most pet parents are very happy with them. 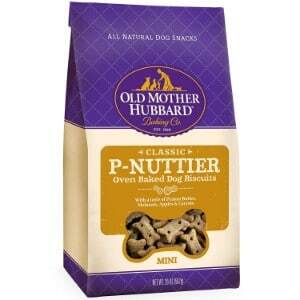 Next up on our list of the best dog treats is another crunchy variety that comes from Old Mother Hubbard. These treats are made with the highest quality, natural ingredients, like carrots, molasses, apples, and even peanut butter, so not only do they offer a delicious taste that your furry friend will love, but they are packed with vital nutrients, which you will love. There are several other flavor options, too, such as veggie, bacon and cheese, and chicken and apples; whichever variety you choose, you can have confidence knowing that your pooch will be getting the very best ingredients. Not only do Old Mother Hubbard dog treats come in a variety of flavors, but they are also available in different sizes. Their mini biscuits are ideal for small breeds, like miniature Dachshunds and English Toy Spaniels; the small treats are great for mid-sized dogs, such as West Highland White Terriers, Border Collies, and Beagles, and their large biscuits are just the right size for large breeds, such as Malamutes, Great Danes, and Saint Bernard. All options are wheat-free, and contain no artificial preservatives. Old Mother Hubbard has been making treats for dogs since 1926, and all of their products are made in North America and are backed by a satisfaction guarantee. Final Verdict: For a high quality, natural, delicious, and nutritious treat that your dog will love, we highly recommend Old Mother Hubbard Crunchy Classic Natural Dog Treats. Made with premium quality ingredients, offered in a variety of sizes and recipes, and free of artificial preservatives, these treats are definitely worth trying. 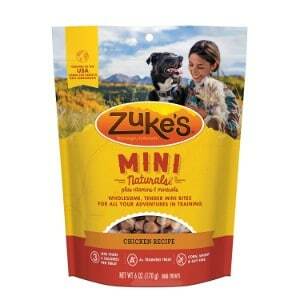 Next up on our list of the best treats for dog is an option that comes from Zuke’s. This manufacturer may not be well-known, but totally should be. They create a wide array of treats that are made of the highest quality, all-natural ingredients. Ingredients include real sources of meat and other whole foods, like cherries, natural carbohydrates, and even turmeric to support proper nutrition. Their treats are also made without corn, wheat, and soy, making them grain free. Zuke’s offers a variety of recipes. Options include chicken, duck, peanut butter and oats, pork, rabbit, and salmon. Furthermore, there’s only 3 calories per treat, so if your pooch could stand to lose a few pounds, offering him these treats and a dog food for weight loss will help him maintain a healthy weight. Most canines will find the crunchy, yet soft texture palatable, and the small size is ideal for training purposes. Final Verdict: For a healthy, natural dog treat, Zuke’s Mini Naturals Dog Treats are a great choice. They are made with natural ingredients, real meat is always the first ingredient, and they are grain free. The mini size makes them ideal for training, too. 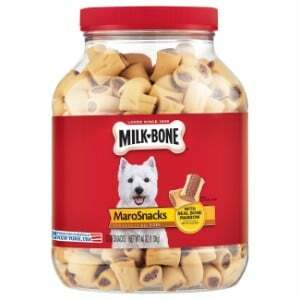 Last, but definitely not least, on our list of the best dog treats is the Maro Snacks Dog Treats from Milk Bone. Pet parents have been feeding their four-legged family members Milk Bone products since 1908 because all of their treats are made of high quality ingredients, and canines just find them tasty. Their Maro Snacks are made with natural bone marrow, as the name suggests. This means that they contain a healthy dose of protein. They are also fortified with calcium, which will help to strengthen and maintain the health of your pup’s teeth and bones. The treats offer the crunchy texture of a biscuit with the softness and flavor of real bone marrow. The size is ideal for training purposes or for supplemental feeding between meals for breeds of all ages and sizes. According to the reviews that we read, most pet parents say that their furry friends love the taste; however, some reviewers said that they believe that these treats caused digestive upset, but these claims have not been proven. Final Verdict: For a tasty treat that your pet will be sure to love, give Milk Bone Maro Snacks Dog Treats a try. Made by one of the most trusted manufacturers of dog treats, your pooch will gobble up these yummy treats. You want to make sure that you are giving your dog the very best of everything, including treats. Whether you are offering treats as a snack between meals or you are using them as a training tool to reinforce positive behavior, you definitely want to make sure that you are offering him the best and safest dog treats. There are so many different treat options available for dogs. We’ve narrowed down the options and selected what we consider to be the top five picks. But how did we pick the five options listed in our review? What type of factors should you take into consideration if you decide to select another treat? In this section of our review, we’ll answer these questions and more so that you can make the best choice possible for your furry friend. In order to choose the best dog treats, we enlisted the help of a panel of experts, including veterinarians, animal nutritionists, and professional trainers. Together, we reviewed the ingredients listed in a large selection of treats from various manufacturers. We also read through the countless reviews that pet parents have provided. Based on the information that we obtained from our panel of experts and the reviews that pet parents offered, we were able to narrow down the selection to the five dog treats listed in this review. Each option is highly recommended by veterinarians, animal nutritionists, and dog trainers. They are also highly recommended by pet parents. We are confident that your pup will love the taste of each of these treats – and that you will have peace of mind knowing that you are giving your pooch nutritious treats. Though we have offered what we think are five of the best treats on the market, you might want to consider another option. There are so many dog treats on the market, and many of them are just as high quality as the treats featured in our review. To ensure that you are selecting the best treats possible, here’s a look at some factors that you should keep in mind when you are shopping. Always take a look at the ingredients. The best treats will be free of artificial colors, preservatives, and flavors. They will also be made of natural, nutritious ingredients, like real protein, fruits, and vegetables. Country of origin. You should also consider selecting treats that are only made in reputable countries, such as the United States and Canada. These countries must adhere to strict guidelines and regulations in order to ensure safety. In other countries, like China, quality control is minimal to non-existent when it comes to the production of dog food and dog treats. Consider the needs of your pup. If your pup has special dietary needs, make sure you take them into consideration when you are selecting treats for him. For instance, if he can’t tolerate grains, make sure that you choose a grain free dog treat; or, if he needs help maintaining his weight, look for a low calorie formula. Consider your pet’s palate. You should also make sure that you consider the palate of your pup. For instance, if he likes crunchy, pick a crunchy treat, and if he prefers a meaty texture, choose a softer treat. Many new pet parents wonder if they should give their furry family members treats. Sometimes, people are under the assumption that they will spoil their pets when they offer their canine companions treats, or they are concerned that treats will lead to weight gain. If you are wondering if it’s safe to feed your four-legged friend treats, you’ll be happy to know that not only doing so safe, but it can also be beneficial. Treats can be a valuable training tool. They are a great way to reinforce positive behavior. Dogs love to be rewarded when they do the right thing, so offering treats can definitely be an effective way to foster actions that you want your dog to follow. In fact, trainers typically utilize treats in training sessions. Another benefit of offering treats is the nutrition that they provide. Feeding several full meals a day isn’t always recommended; particularly for small breeds and those that are prone to weight gain. However, you can feed your pet a treat to tide him over in between meals; for instance, you might offer him a treat in the morning and one before bed, and feed him a full meal in the late afternoon or early evening. Not only will doing so keep your pup satiated, but it will also ensure that your pet is receiving the nutrition that he needs. Lastly, dog treats can help to improve your pet’s dental health. This is particularly true of crunchy treats. They help to brush off plaque and tartar buildup, which can help to strengthen his teeth, freshen his breath, and even help prevent tooth loss. Offering your canine companion the best dog treats is a great way to foster positive behavior, keep him healthy and happy, and just let him know how much you love him. By offering your pet any of the treats that are mentioned in this review, you can have confidence knowing that he you will be keeping him happy, and that you will be offering him well balanced nutrition.